Everyone expected Gennady Golovkin and Canelo Alvarez to deliver a scintillating thriller, and they did just that. However, the fear many had leading up to the fight sadly became a reality. Golovkin retained his middleweight world titles on Saturday night – Mexican Independence Day – before a sold-out crowd of 22,358 at T-Mobile Arena in Las Vegas, but the crowd left with a sour taste in their mouths. Judge Dave Moretti scored the fight 115-113 for Golovkin, Adelaide Byrd, who also turned in a questionable scorecard for a fight Friday night somehow had it 118-110 for Canelo, and Don Trella had the bout even at 114-114 for a split draw. The ruckus cheers quickly turned to boos and even more shockingly, sort of reminiscent of Rocky IV, Golovkin was cheered by the crowd, while Canelo, who came into the fight as the fan favorite, was booed heavily – even by his own fans. FightNights.com scored the bout 116-112 for Golovkin. Bob Bennett, the executive director of the Nevada State Athletic Commission, spoke at the post-fight news conference and defended Byrd. Alvarez thought he won the fight. According to Compubox, Golovkin landed 218 of 703 punches (31 percent), while Alvarez landed 169 of 505 (34 percent). Furthermore, Golovkin out-landed Canelo in 10 of the 12 rounds. The scrap began with deafening roars heard all across the arena, but there was not much action as both fighters tried to establish their jab. Both were able to land with efficiency, but Golovkin’s were more powerful, and had Canelo at bay. Canelo, 27, of Mexico retreated to the ropes in the fourth round looking for a place to counter, but Golovkin, 35, of Kazakhstan was not fooled and connected with hard body shots, and stung Alvarez with a few more as the Mexican moved out of range. The fifth round turned into a real war with Golovkin pounding Alvarez with a hard right hand that snapped his head back, but Alvarez returned the favor with a right hand of his own, with Golovkin emitting a smile. Alvarez appeared winded as the seventh round begun and spent most of the round on defense as Golovkin continued to stalk him. Canelo seemed to slow down more as the eighth round began and Golovkin got right in his chest and fired a sharp uppercut that stung Alvarez. Although he landed in the round, his punches didn’t seem to bother Golovkin. Both fighters continued to trade heavy leather in the ninth, but Canelo took the worst of it, while Golovkin kept charging forward. Alvarez’s incredible chin held up and he connected with a hard right hand on Golovkin’s skull as the round came to a close. 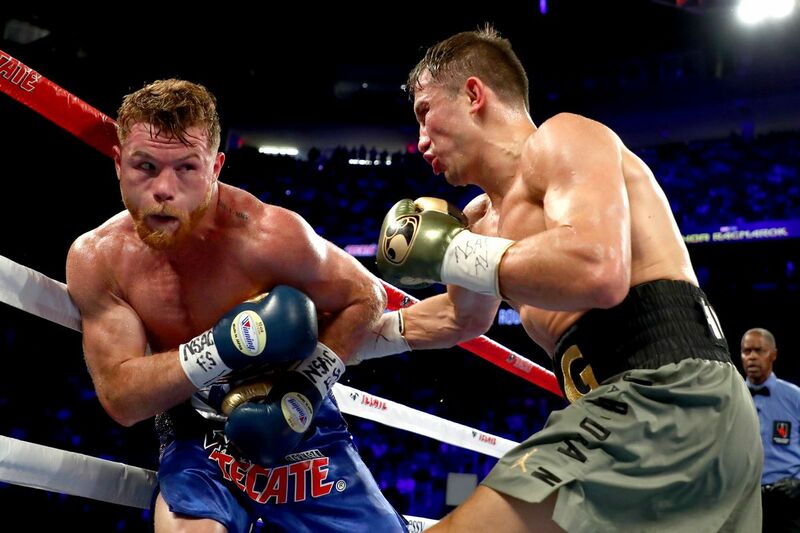 The 11th round was more of the same – a non-stop action round, but Golovkin’s punches were clearly hurting Canelo again. However, he came out in the 12th with new life. Alvarez landed a hard right hand and a four-punch combination on Golovkin, but he walked through the fire to get back into the fray and rock Alvarez. Although it didn’t live up to the brutality of Hagler-Hearns, it was still a hellacious and punishing scrap. Golden Boy Promotions President Eric Gomez would not confirm or deny whether a rematch clause would be exercised, but noted that it is a possibility. Both fighters, though, are ready to go at it again. “I always said I was going to be a step ahead of him. We’ll fight in the second one, but I’ll win.” Alvarez said. Although disappointed by the result, Golovkin wants to settle the controversy once and for all.